You can’t get more high-end than a specialty food shop in some cities… and you can’t get more laid back than a country diner. But can you have both? You can -- and thrive -- when you’re Keeley DeSalvo and you own next-door neighbors The Pancake Shop and The Savory Pantry. She’s managed to do it without sacrificing a bit of quality or respectability on either side of the coin. 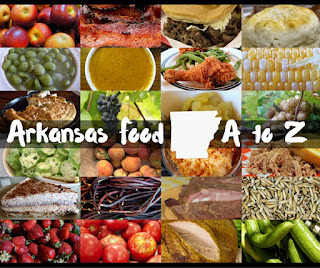 I was invited along with several other Arkansas food bloggers, journalists and the like to a special gathering at The Pancake Shop last week. We had a lot to accomplish, but before we got started with the neat little nitty gritty about this and that, we had ourselves a breakfast. 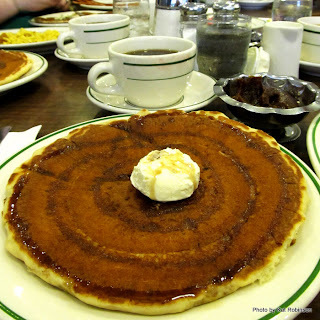 I’ve written about The Pancake Shop before. 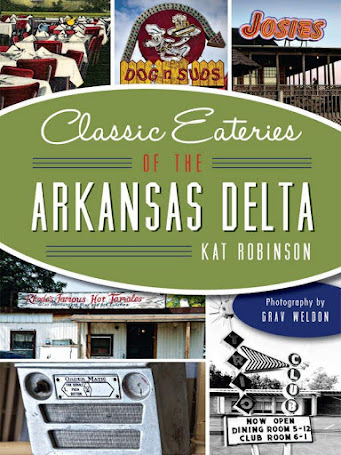 It’s been around since 1940, starting out across the street and then moving to its current location in the 1950s. The current location is purportedly the former location of an Italian restaurant; Keeley says she’s not brave enough to tear up the floor to see if the original mosaic floor is under the tiles in the shop. The original place was called Mason’s. Keeley’s folks, Tom and Ruth Ardman, bought the shop in 1990. She came back from the Washington DC area in 1995 with her husband Stephen and joined them running the place. And here’s where the uppity bit comes in. Keeley found right off the bat that there were a lot of items she couldn’t find in Arkansas, things like lemon curd and specialty salts and gourmet olive oils. 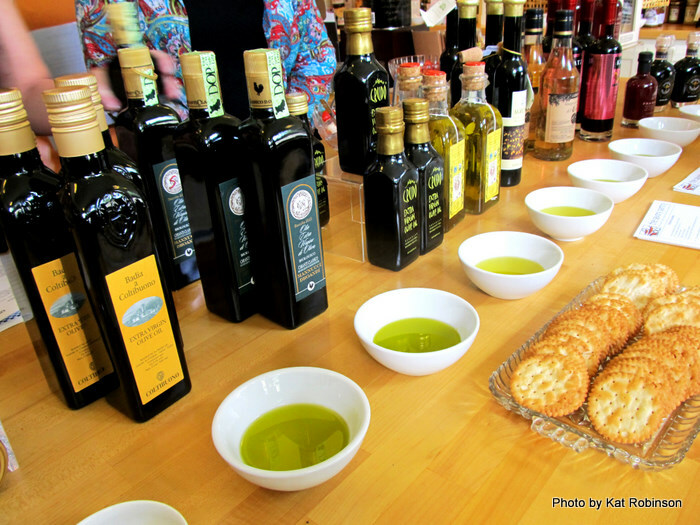 In fact, it was olive oil that drove her to open The Savory Pantry in 1998. At the time, the idea was to bring in a few items that couldn’t easily be obtained here and sell them alongside The Pancake Shop’s signature items -- hams smoked here, special sausage blends, apple butter and the restaurant’s coffee. Thing is, The Savory Pantry filled a gap that needed to desperately be filled. 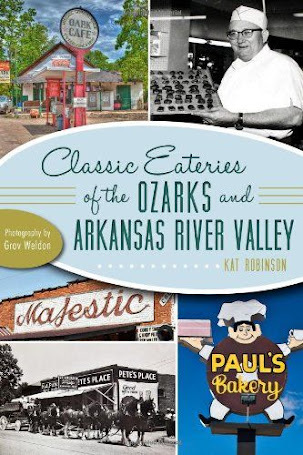 There weren’t any specialty foods shops in Hot Springs -- heck, I don’t think there were any in Little Rock at the time, either. Customers gladly absorbed what was already available at The Savory Pantry and begged for more. The shop was moved to the other side of the restaurant into a larger space. The website was launched in 2000 and was an immediate hit. Today, it’s home to a couple hundred different items that you can’t find elsewhere in the state. Keeley has fine brands of what could be considered to be exotic foods right next to homegrown favorites such as J&M Cheese Straws, Liz and Linda’s Pepper Jelly and MaryClare Macarons. Pantry and gift baskets are available. So… there you are. Our group enjoyed breakfast at The Pancake Shop. It was nice to be able to hear the reactions of others who shared the table; I’ve found the place to be one of my must-stops on any Hot Springs visit, and I’m glad to report others will be adding it to their list. 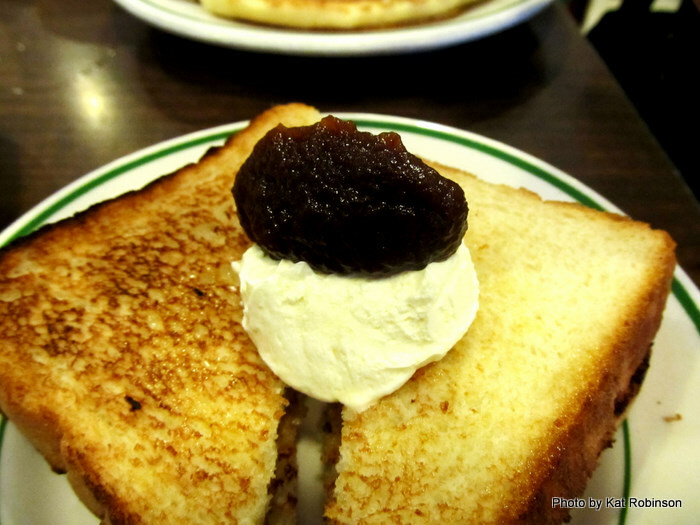 I had my usual -- a single pancake, a cheese omelet and toast with that amazingly good apple butter. Pancakes at The Pancake Shop are huge. 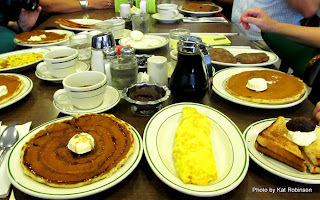 I laugh when I hear first-timers come in and order three -- they have no idea how much food that is. I love the light, fluffy ‘cakes and the butter that’s house-patted for easy serving. 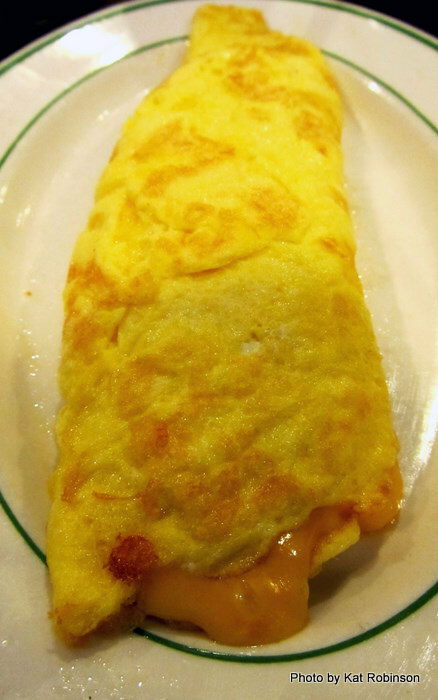 I know my omelet’s going to be just fluffy enough and stuffed with plenty of cheese and that the apple butter itself will be perfectly fruity with a nice flavor of cinnamon. It’s just a given. 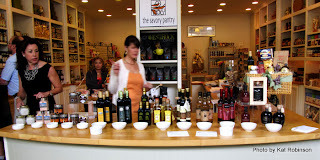 We went from there next door to The Savory Pantry, where we were allowed to wander around a few minutes and try some of the many items available at the shop. 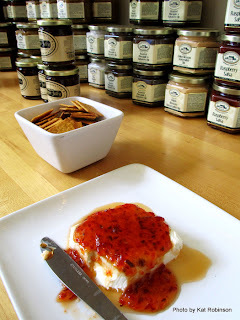 There are always several samples out -- a dozen or more on any given day, all sorts of dips and jams and syrups and condiments and sometimes even tiny tarts, crackers or chocolate. The shop is set up perfectly for this with wide counters, clean lines and uncrowned shelves. After a few minutes we were given the chance to enjoy a couple of special tastings. 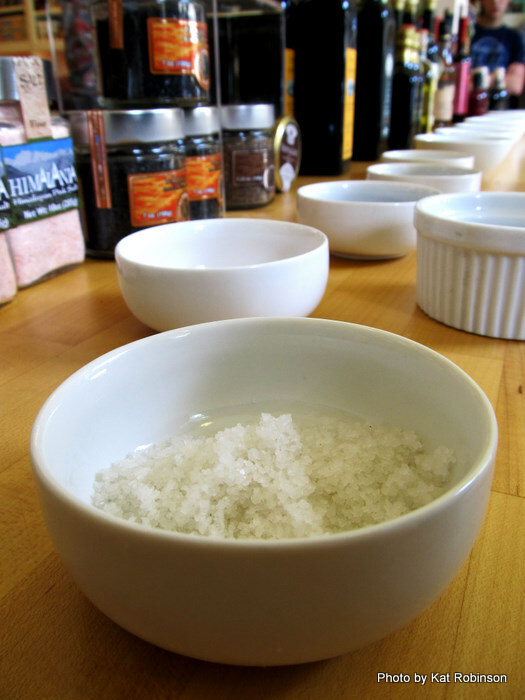 This was a new experience for me -- I’ve been to wine tastings and cheese tastings but never before to a salt tasting. 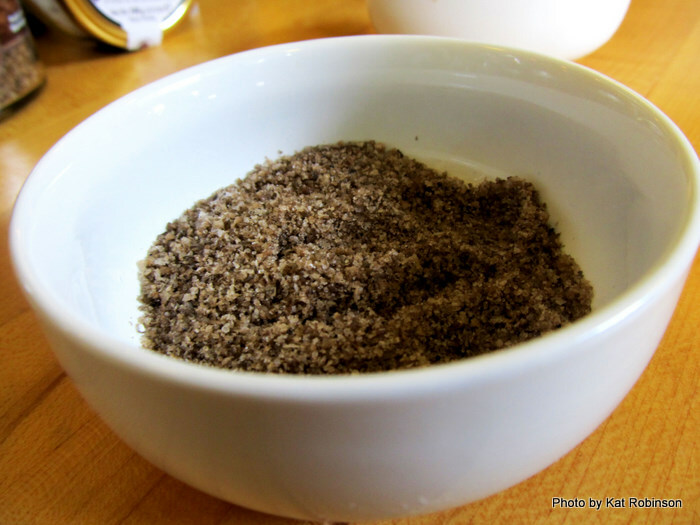 We tasted several different varieties -- fleur de sel, which comes from evaporated salts; pink Himalayan; dark Hawaiian salt and a beautiful smoked salt that screamed about barbecue adventures in my mouth. It didn’t take much to absorb and enjoy each one… a tiny bit on a spoon turned out into the palm of one’s hand, a touch to the tongue, a moment to savor and a bite of cracker or swish of water before heading on to the next one. Keeley and the girls who work at the shop broadly discussed each one and its attributes. But we weren’t done with that. We went directly on to an olive oil tasting, divining the differences and flavors of a selection of different oils with different pressings. Flavors and scents were discussed. My favorite of these was a delicate oil pressed with lemons. It was almost like a lemon cordial. 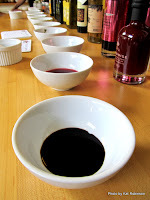 We also sampled vinegars, including a couple of balsamic vinegars served up on salad and with bread. Each flavor was discussed at length, with suggestions on uses and the like. I also had a chance to speak with the ladies who just started MaryClare Macarons last November; their macarons are only available through special order or through retail at The Savory Pantry. I have fallen in love. We went from there back to The Pancake Shop for a cupping. 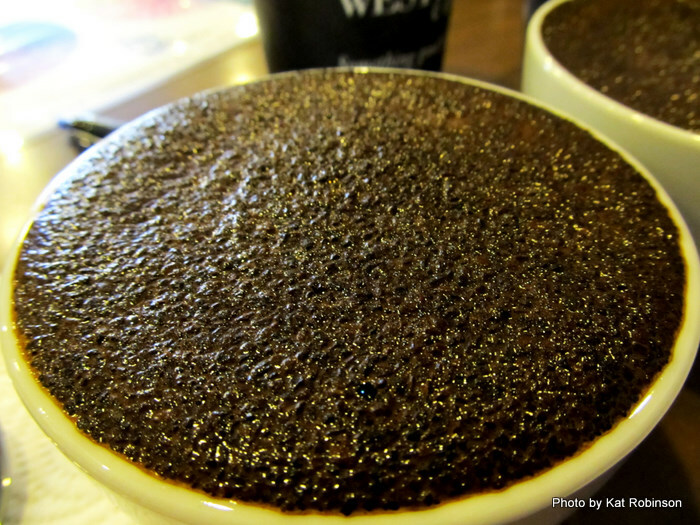 That’s a coffee tasting, in case you were wondering. 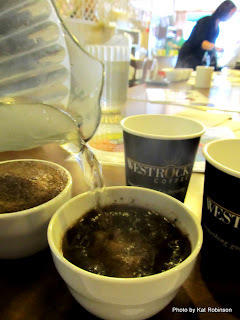 Peter Guerin from Westrock Coffee had come in just to share with us the art of coffee tasting. He showed us each individual step of sniffing the grounds (best done lightly with mouth open), creating a crust with boiling water, breaking the crust and slurping the hot coffee for flavor. We tried three regional coffees -- one from Brazil, one from Guatemala and one from Rwanda -- that had a medium to dark roast. 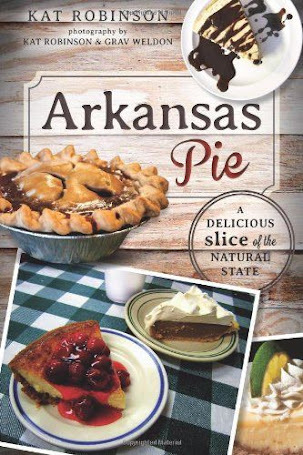 This sort of event may seem out of place in Arkansas -- and I dare say, elsewhere in the state you’re just not going to find it. But that’s the sort of thing The Savory Pantry makes possible. So yeah, it’s uppity. And you can’t get more down-home than The Pancake Shop. It’s an interesting parallel, but I don’t think it’s a study of opposites. Keeley’s attention to detail is evident in both places. High quality details are attended to quite well. Makes me kinda proud to say I’ve been talking about both places for quite a long time. So if you find yourself in Hot Springs, make your way north of Bathhouse Row and drop in. 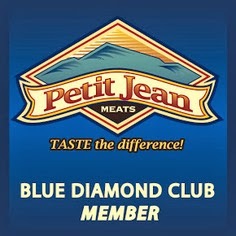 And if you can’t, check out the website and order something good. Also, check out Michael Roberts' review of The Pancake Shop from our visit over at Arkansas Foodies. The macarons are seriously delicious. I was pretty amazed that each flavor was so similar in texture but so varied in flavor. I can't decide which I liked more, the macarons or the strawberries with balsamic. We've been so busy that I haven't had a chance to put up any pictures from the Savory Pantry part of the day, but hopefully that'll happen later in the week. Wow, that sounds amazing! Great photos, too! I'm so bummed I wasn't able to attend. 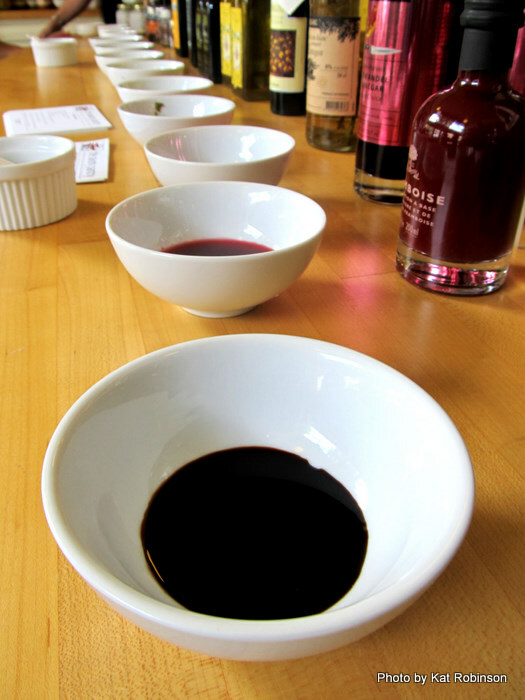 I am seriously an olive oil and balsamic vinegar junkie. I've been known to do shots of it like others do alcohol. 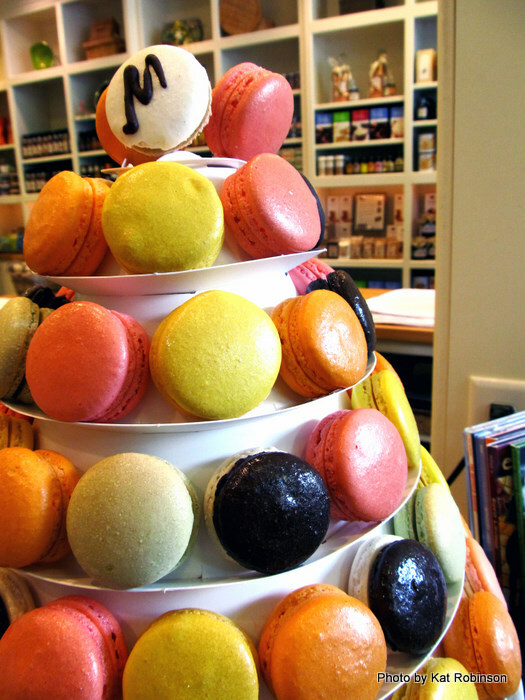 ;) But I've visited the Savory Pantry and purchased said macarons (worth every penny) and some volcanic salt. Highly recommend! I guess if you come for the "special dinner for bloggers and foodies" they do something totally different than they do for the regular customer. 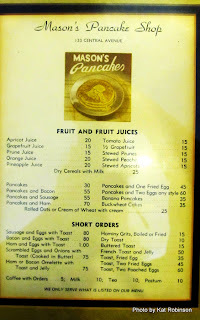 This place was over priced with heavy tasteless pancakes, fake syrup and rude waitstaff. It does explain all the glowing reviews and pictures of pancakes that look nothing like what we had this morning. Good way to snooker people sadly. Patt, I'm sorry you had a different experience. 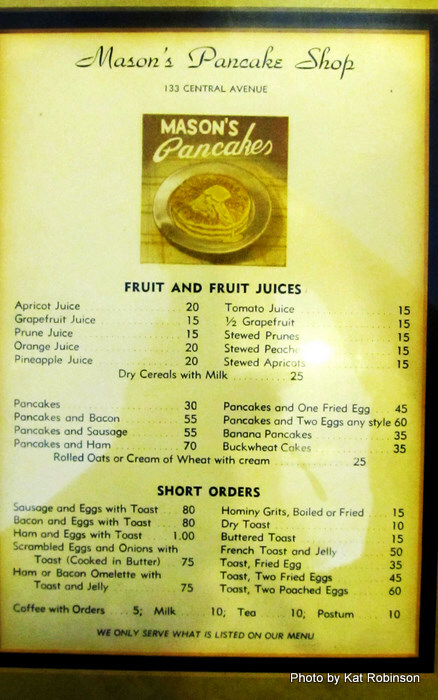 Mine with The Pancake Shop has always been pretty dang good. If I'm planning to be in town for any length of time or I'm meeting someone for breakfast there, it's where I take them. I have found it to be very consistent, with good coffee (and superb apple butter).